The Emirates National School reviews - add yours here. There are two unrelated Emirates National Schools in Sharjah. This page refers to The Emirates National School, Indian CBSE school in Al Nekhailat area. The other school is the Emirates National School Sharjah campus, part of the Emirates National Schools (ENS) group based in Abu Dhabi for Arab students. TENS is also unrelated to the Emirates Private School in Sharjah (EPSS), another Arab school. Emirates National Private School Sharjah is not an official school name in Sharjah, it might refer to TENS, ENSS, or EPSS. 2018-2019 fees increased effective 01 Apr 2018 (last increase from 01 Apr 2014). Bus transport fees AED 200 monthly (Ajman or Sharjah), AED 250 monthly (Dubai). 2017-2018, 2016-2017, 2015-2016 school fee structure same as 2014-2015. 2014-2015 fees revised effective 01 Apr 2014. Admission or registration fee not given. Bus transport charges (annual) AED 2,000 for Sharjah and Ajman (AED 200 monthly), AED 2,500 for Dubai (AED 250 monthly). 2013-2014 fee structure not provided. 2008-2009 admission and tuition fees information not supplied. Owner's name, number of students and staff, teacher pay scale, not provided. Additional email address possibly thomsens@eim.ae (not confirmed). CBSE affiliation number is 6630030. FB page at facebook.com/The-Emirates-National-School-22973693042/, but limited information, not updated since May 2012. Location is in Al Nekhailat community of Sharjah (Al Nakheelat, Al Nakielat) community of Sharjah. School campus is between Salma Bint Omeis Street (St 59?) and Afraa Bint Obeid Street (Str 51? ), access off Sheikh Khalid Bin Saqr Al Qasimi Street. Approximate GPS coordinates 25°22'48.94"N, 55°25'31.91"E (25.380260, 55.425531).Some references say Maisaloon (or Maysaloon) but this is a different suburb, TENS is not located there. Vacancies listed on careers section on TENS website. Send application letter and CV to hr@tens.ae. Fees increased from 01 Apr 2018, fee schedule updated. Email address updated to info@tens.ae (previously thomsens@emirates.net.ae). New domain and website at www.tens.ae (from Oct 2015?). Previously was www.theemiratesnationalschool.com (don't click, redirects to multiple suspicious looking websites). Official website not supplied. Domain URL ens.sch.ae is for the ENS Group, not ENS Sharjah. Online registration not available. TENS sometimes referred to as Emirates International School Sharjah (EISS or EIS-SHJ) or Emirates National High School Sharjah. But is not related to Emirate International School in Dubai. facebook.com/pages/The-Emirates-National-School-Sharjah/191162960963225, seems to be an unofficial page. Limited information available. facebook.com/pages/The-Emirates-National-School/22973693042 - no updates since May 2012.
facebook.com/pages/Emirates-National-School/110541612300846 - auto-generated FB spam, no information. Principal is Ravi Thomas or George Thomas Kutty? 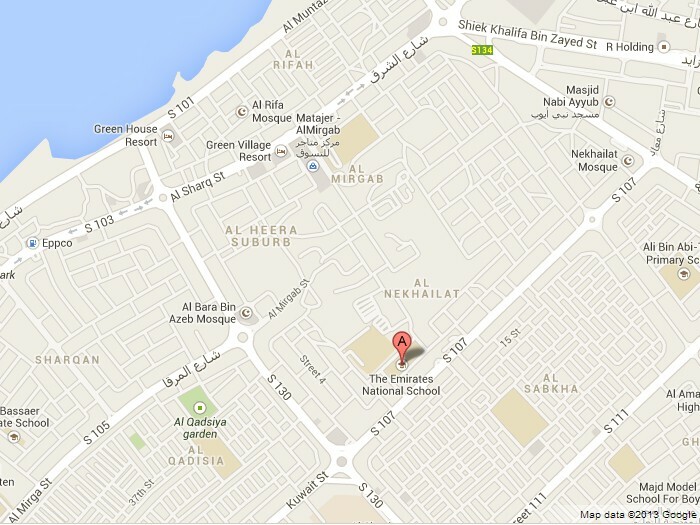 ENS location is off Sheikh Khalid Bin Saqr Al Qasimi St, near the Al Nekhailat Primary School? PO Box 21249 seen in some sources is for the new Horizon Indian School Sharjah in Al Qadisia suburb? ENS Sharjah expanded from junior school to secondary or high school classes? And Mr Ravi Thomas is still the principal apparently. ENS Facebook page with photos but no videos might be at facebook.com/pages/The-Emirates-National-School/22973693042 (doesn't seem to be an official page, or updated much). No official website found or supplied for ENS Sharjah. Date school established might be 1980 (not confirmed). Many popular schools are full for 2019-2020. New schools in Sharjah might have places. Study in Sharjah - list of curriculums and qualifications. www.dubaifaqs.com/the-emirates-national-school.php (PDF and print version).